Since Extended is the only mode that handles the newlines correctly but you need to match with regular expressions, you will need to do this in two steps. 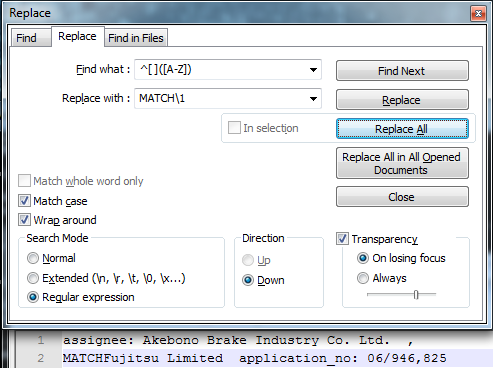 First, use a regex find and replace to add some recognizable token to the beginning of each line you want to move up, I used 'MATCH' but you could definitely change this. Then, switch to Extended to search for a newline followed by the token, and replace it with an empty string to delete both the line break and the token. 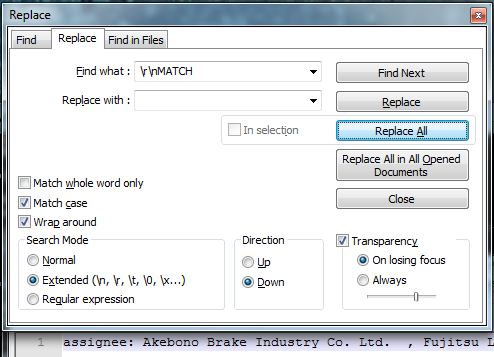 You can't do that with regular expressions due to a flaw in the Scintilla engine which Notepad++ uses. However, it works in "extended" find mode, so use that. Search for ,\r\n and replace with ,. Change the \r\n to only \n on Linux, or to only \r on Mac OS. Just open your text file and get cursor to firts line, then run this macro. Not the answer you're looking for? Browse other questions tagged regex notepad++ or ask your own question.